Depuis 1998, la Petite enveloppe urbaine a rassemblé des citadins de différentes disciplines autour de thèmes touchant leurs modes de vie et leurs mondes imaginaires. La petite publication a infiltré différents réseaux, dans divers pays sous la forme d’enveloppes de papier contenant plusieurs projets inusités. 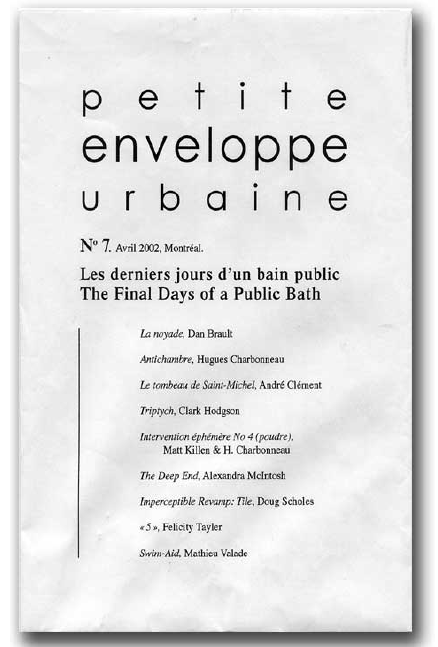 Since 1998, the Petite enveloppe urbaine has gathered urbanites of various disciplines around topics concerning their ways of life and their imaginary worlds. The small publication infiltrates different networks in various countries taking the form of paper envelopes containing assorted uncommon projects. The Petite enveloppe was founded in 1998 and was coordinated by Hugues Charbonneau (and other guest coordinators) until 2000 when it became produced under the auspices of the Centre de recherche urbaine de Montréal. Since no. 11, published in 2004, Hugues has passed on coordination of the Enveloppe to other members of the CRUM.